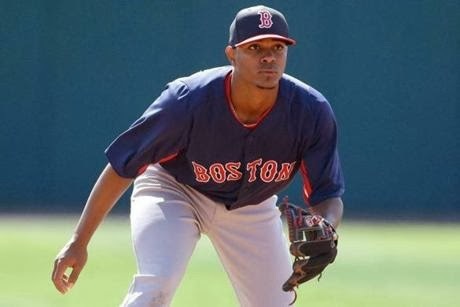 I am very excited to watch Xander Bogaerts play a full season of baseball. The excitement I feel is the same way I felt heading into the 1997 season to watch Nomar Garciaparra. The difference of course was the 1997 Red Sox were not expected to do much and they didn't. Nomar was that shining light at the end of the tunnel, hope for the future. The 2014 Red Sox come in as defending champions and Xander Bogaerts was front and center during the title run. Bogaerts is one of many talented Red Sox prospects but he appears to be the one with the highest ceiling. He has MVP potential but there is one issue, his defense. Bogaerts has a strong arm, and soft hands. Skills that made his transition to third base during the playoffs last year look awful easy. The Red Sox insist that Bogaerts will be fine at shortstop this season. Brian Butterfield has been working hard with him on his first step. Xander struggles going to his right. This was evident yesterday in a game against the Cardinals when Allen Craig reached on an infield single to the right of Bogaerts. Will Middlebrooks at third base would also make an error in the game. It was a reminder of what happened in Game 3 of the World Series last year when Middlebrooks entered the game in the 7th inning moving Bogaerts back to SS. The game was tied at 2 and Matt Carpenter led off the inning with a soft infield single to the right of Bogaerts. It was a play that Stephen Drew had been making all postseason long. Carpenter would come around to score. I don't want to bash Bogaerts. He is a great talent and appears to be a humble and a hungry kid. He is a Face of the Franchise type of player. I just don't think shortstop is the best spot for him. This is why the Red Sox would benefit having Stephen Drew for at least this season and maybe next. A defensive left side of the infield of Bogaerts and Middlebrooks is a liability. Keith Law ranked Mookie Betts as the best most blocked prospect in baseball. Betts is a second baseman who can also play shortstop. Law ranks him on the list because he sits behind Dustin Pedroia and of course Xander. Blocked he is, for now anyway. Betts at shortstop and Xander at third base could be the future for the Red Sox. I just wish we had Drew to bridge that gap.